When we lived in Kansas, it took me two weeks to realize that we did not have a microwave. As you can imagine, if it took me two weeks, I don’t use the microwave very often. Occasionally to melt butter, chocolate, or pop popcorn. 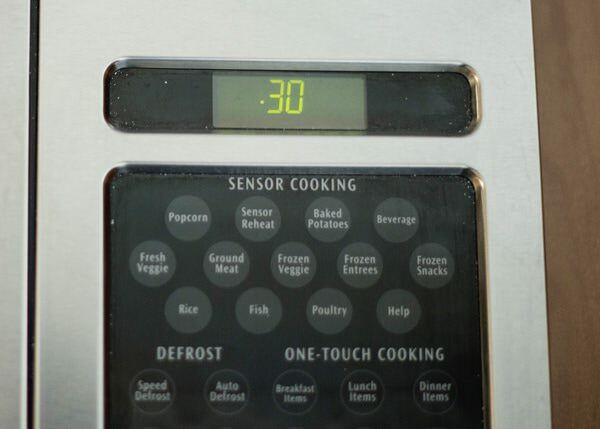 I do have a microwave now, and truthfully the only thing that I really use it for is the timer. Every now and again, I get a craving for popcorn. I don’t eat it very often, but when I do I want real, buttery, hot, popcorn. I have tried a million times to make it on the stove, the old-fashioned way, and I always end up burning it (which is the worst smell ever) or getting gun shy and stopping before all of the kernels have popped. So I resorted to the microwave variety when the craving struck. It never scratched the itch, and I stopped eating popcorn all together. I was watching Southern at Heart on the Food Network and Damaris made popcorn using a method that I have never seen before. She swore by it, and now so do I. Not only did I not burn the popcorn, all of kernels popped, and I finally got a bowl of warm buttery perfect stovetop popcorn. I made a quick honey butter to pour over the popcorn because I love sweet with my salty. I used Maldon sea salt and love that some of the bites have big flakes of salt. So. Good. We now have a new movie night tradition. Cover and cook over medium-high heat until all 3 kernels pop. Take the three kernels out of the pot. Cover and take the pot off of the heat. Put the pot back on the heat. Cook, shaking the pot occasionally until the popping slows down. After about 2 minutes, and the popping has slowed down, take the lid off of the pot. This lets the steam out and keeps the popcorn crisp. While the popcorn is popping, melt the butter and add the honey. Pour over the popcorn and sprinkle with salt. Toss until completely coated. You could also do this in a large paper bag. Love the honey butter on top! Sounds amazing. What is the stove top temp? Medium-high. It is written a few times in the recipe. yes, I’d like to know temperate;I have an induction stove top. I have two alternating lids I use when I pop corn, & wipe off steam to make sure that no moisture is dripping down into my kernels. It helps. Want to try the honey w vegan butter. AND coconut oil. I normally use peanut oil because it takes high heat. wow i have never seen this way before but i looks perfect! I also get gun shy and end up with more kernels than actual popcorn too haha. i bet that coconut oil adds a great flavor to it too. and ugh i can just imagine those big chunks of salt…yessss! I don’t think that coconut oil really tastes like anything. I think that it is pretty neutral. But I love this method. I’ve made it quite a few times and have not messed it up yet! You can’t taste any coconut. My husband hates coconut and he doesn’t know that I use coconut oil to make popcorn, even though he can taste it when its raw. I think it’s better because it doesn’t burn like other oils so the kernels can get really hot and pop bigger. first time I’ve ever made popcorn on the stove and boy was this recipe a smashing hit!!!! thanks! Absolutely love love love this recipe. Thank you!! I much prefer fresh popped corn to the microwave crap. Coconut oil is the best for popping, too, although I use considerably less than 1/4 cup. I probably put a heaping tablespoon of oil for every 3/4 to 1 full cup of kernals. that’s quite a lot of corn for a small amount of oil. We had a certain pan at home that was pretty much only used to make popcorn, I believe it was like cast aluminum, even heating. we always used 1/2 cup of kernels to 1/4 cup of oil and it was a full pan when popped. more fat results in a more tender texture, still crunchy but not so dry. and I prefer white popcorn to the yellow, the hulls aren’t so huge in the finished product. My. favorite. snack. I love making my own popcorn too! So easy and free from unwanted stuff! Me too! I think that it tastes so much better too. Thank you for pics and tips! Did you know you can also pour the kernels in a plain paper bag and microwave them? Pops beautifully, then you can put in big bowl and season/dress it however you like. Saves a few calories from not using oil, can add more butter ;-). Why?? Are you one of those freaks that thinks the microwave gives you cancer?? No, I’m not one of those freaks, but I don’t like how my house smells when they microwave popcorn. Lol Dude the radiation is known to cause cancer. Actually, you’re safe using a microwave if you remember to keep your tinfoil hat on. I don’t know how to keep a computer virus from giving you cancer, though. The beauty of using coconut oil is that it is really very good for us. No need to shy away! Omg Karen. I had no idea you could microwave in a brown paper bag. I tried the above recipe – disaster. Paper bag – perfect. Thank you! Oil is a healthier option. Butter not so much. Bree, this is how I make my popcorn! And I think you know how much I love popcorn! You know what else I do? I pop it in a mixture of coconut oil and butter and shake in popcorn salt too before it pops. If you are feeling really fancy you can liquify some coconut oil and ghee together and pop it in that. Heavenly. I wonder why though, popping 3 corns first… Why? The sugar will burn really easily. The three kernels are to regulate the heat. You know the heat is hot enough when they pop, you take it off the heat for 30 seconds to even it out and then they will all pop at the same time. Yeah! I love coconut oil. I use it for a lot of things. Its really healthy and full of good fats. I made this recipe for the first time today. I always used microwave and the read about how bad it is for you. I followed your directions but added a slice of butter and some Stevia to the Coconut Oil after the 3 kernals popped. It popped up perfect and tasted like Kettle Corn. I will never use microwave again! I followed your recipe and my Dutch oven caught on fire. Luckily, I was able to extinguish before my kitchen ignited. I’m really sorry you almost torched your kitchen. No one else has had this problem, so I am going to assume you had your heat higher than you think you did. I can’t wait to try this! I do have one question. Do you remove the pan from the heat at the same time you remove the lid? The only time you take the lid off is to get the 3 kernels out. Wow! That honey butter sounds delicious! I only just now conquered stovetop popcorn. I was starting to get a complex! If I had to choose one thing that made the biggest difference, it would be that 30-second thing. Makes all the difference in the world, doesn’t it? I agree 100%, the 30 seconds is the key to making good popcorn. What does the 30 do exactly? 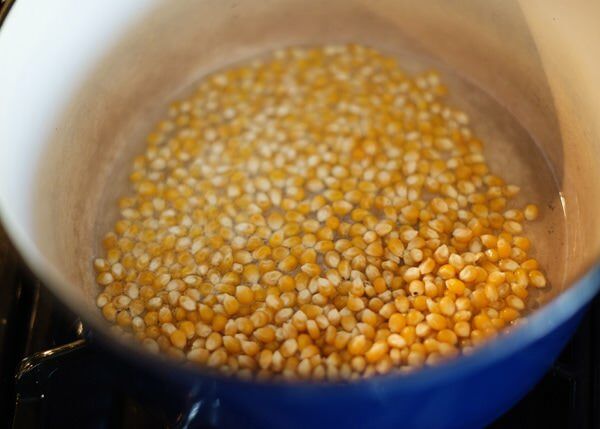 THANK YOU for posting this – this was my first attempt ever at making stove-top popcorn, and while I was skeptical, it couldn’t have worked more perfectly!!! Not a single unpopped kernel. I’m absolutely amazed! I know, right??? It’s crazy, but works every. single. time. Do you think this can be made in advance of an event? Or about how long ahead of time could you make it without the popcorn getting soggy? Probably a few hours. Or even a day if in an airtight bag. I might do an experiment before the event. Ahhh thank you so much for posting this!! I love popcorn and always want it, but I don’t have an air popper. My friend’s father made popcorn on the stove once and it was such a tough texture, so I wrote off stovetop popcorn in my head. So, thank you for fixing and feeding my eternal popcorn craving! 😀 this turned out perfectly! Isn’t it like magic? I make this a lot and it always works! I’ve tried a lot of different stovetop popcorn methods and this one worked the best. Quick and no burnt kernels. I know, it’s the best, isn’t it? Thank you! I didn’t do the topping and I used about 1/2 cup more popcorn but this method seriously was perfect. Will be using often. Thanks! I used to be a pro at making the most delicious stovetop popcorn, but then, ever since about a year ago, any time I try to make it – complete tragedy. Tonight I had a craving for popcorn and tried to make some – utter catastrophe. I then went to this website and tried to make another batch, exactly as your instructions showed, to a tee, and still, terrible terrible popcorn. More kernels popped this time, and they weren’t small shriveled up pieces, but they still weren’t light, fluffy, airy popcorn. They were dense and small as all hell. I don’t know what is wrong with me but I think I’m just going to give up attempting to make popcorn ever again. Sorry Cassidy. Maybe it is the pot you are using? How old are your popcorn kernels? Maybe fresher ones might pop better? If you’re having problems with small, tiny popcorn I would try paying a little more for named brand popping corn. If you get the same results I’d recheck your cooking process as its most likely the problem. I tried this recipe with popcorn from my local farmer before learning that most (if not all) popcorn needs to dry to the correct moisture content. In my case, my farmer recommended 5 months this year. I have also tried some heritage variety of kernels (that a different farmer already aged approximately.). Then I tried “organic” popcorn I bought in bulk from my local co-op. My results: popcorn that is too young or too old (not proper moisture content) did not pop up fluffy and was prone to burning. The heritage kernels turned out fine but were smaller and more flavorful than today’s popcorn I’m used to. The bulk popcorn I bought didn’t pop well and burnt easily. (Based on what I’ve learned, I wonder about is moisture content.) I needed some popcorn for a recipe so ran to my neighborhood grocery that same day the bulk wasn’t working. I bought classic Orville Redenbacher’s, used the same pan and technique from this page that didn’t work for the bulk, and Orville’s turned out marvelously! Great recipe. Thanks for publishing. My brother recently made stovetop popcorn using bacon grease, and it was absolutely delicious. I know … not at all healthy, but delicious all the same! I wanted to make some, but I had never in my life made stovetop popcorn. I used your instructions, and it was great! I only had 3 unpopped kernels! Next time I’m going to use coconut oil and try your honey butter. Thanks! Your brother is a smart dude. Great method!!! First try and it was picture perfect. Tastes great too. Thanks so much for posting!!! I don’t mind microwave popcorn, but my microwave broke and I’m waiting for the new one to come in, so I gave this a try tonight when I was craving popcorn. Unfortunately, my new Cuisinart Dutch oven shattered before the 3 kernels had even popped, and coconut oil got all over the stovetop, causing a lot of smoke. That’s terrible Jen! Sounds like you got unlucky with a defective pot – hope you got it replaced. Cast iron (if yours was a cast iron Dutch oven) really need to first be heated up slowly. Sorry that happened to you. I always heat mine on med. low for 5 or 10 minutes before turning up the heat. I had a failure. BUT, I think it was because one of my 3 kernels didn’t pop and the oil hot too hot. As soon as I added the other popcorn they immediately started to pop! I had probably 1/2 uncooked kernels. I should add, this was my first time to ever try stovetop popcorn. You need to have all 3 kernels pop. It is how you know the heat is regulated. I don’t think that word means what you think it means. You can only regulate heat by turning it up, down, or removing the pot. The kernels are indicators, not regulators. If a kernel is bad, it may not ever pop and you would get a bad idication of when the oil is hot enough. Waiting for all 3 to pop is a good rule of thumb, but if one is taking significantly longer or the oil is smoking, it’s a good sign the kernel was a dud and the oil is too hot. Let the oil cool a bit and move on. I’m pretty sure I know what regulate means. Thanks for clearing it up for me though. The whole purpose is to take the pot off the heat so that the heat evens out and them all of the kernels will pop. Sure, you may get a dud every now and again, but it is about even temps. I looked this up as I was actually confused. You guys, this right here is why I sometimes don’t want to have a food blog anymore. I am a HUMAN and occasionally make mistakes or not make myself clear enough. Let’s be honest, none of us are perfect are we? I do appreciate your need to make sure I know that I’ve made a mistake. Thank you so much for clearing it up for everyone. Girl…keep on shining! You saved my biscuits with this recipe! I have to make over 100+ favor bags of my homemade caramel popcorn. I was using the microwave method but was not satisfied with the results. Did my research and happened upon your blog. I think you’re a wizard and magical and all things rainbows and glitter 😉 keep up the good work doll! I am so glad that it helped you out. The comments section surely is fun to read! Some people who made mistakes pass the blame to the author of this recipe. Not only that, they do their best in finding an error in the recipe instead of checking themselves what went wrong in the entire process. Grow up! If others can do it, sure you can! Mistakes happen, but there’s always room for improvement. No one is, and ever will be perfect. But anyone can be at their best. Bakedbree, thank you for this recipe. Cheers! I just tried this for the first time, and I had a similar issue. Two of the kernels popped and the third took waaay, waaay longer. Even though, I had a few burnt bits and a couple unpopped kernels, it was the best method of stove top popping I’ve tried yet. Next time I’m going to use 7 kernels and heat until five pop. You only need to do 3. The purpose of this is to make sure your heat is regulated. They might not pop evenly, but once you take the pan off the heat, it will be even. Bree, thank you! Your recipe came up on the front page of my google search for “stovetop popcorn tips” and absolutely saved the day : D I was having a craving and the first couple of burnt and half popped batches really didn’t hit the spot. I bet my neighbors are thankful also! Simply amazing! I want to share this with everyone! Tried this today and it’s an absolute winner. Definitely save to my favourites list. Thank you. Thanks for this amazing recipe. 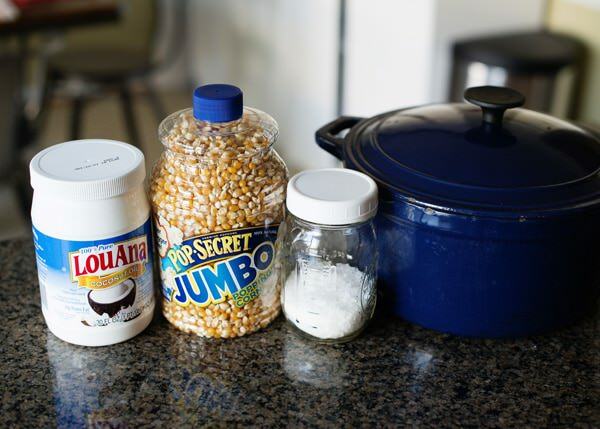 Who knew that making popcorn on the stove instead of in the microwave could be so easy! The only thing I found was that the topping is waaaaaayyyy too salty for me. The second time I tried it I skipped the sea salt in the topping and then just added a sprinkling over the top once it was all done. Perfect. You are welcome. You can flavor it any way that you like. Thank you! I’ve never made stove too before. So good! Totally works! As a topping I just drizzeld honey once they were popped and added a sprinkel of salt, delish! First time making stovetop popcorn today…I’m 36, so the previous commenter need not feel so bad. We always ate the microwave stuff growing up. I used coconut oil and seasoned with Kernel’s Seasonings Cheesy Jalapeño for a spicy kick. It was great! Thank you for the wonderful tips! I’m glad that it worked for you. I am so glad! I love it too. And MUCH better for you than the movie theater variety. Oh this is so so good! We have always been a fan of air pop but are just trying stove top! 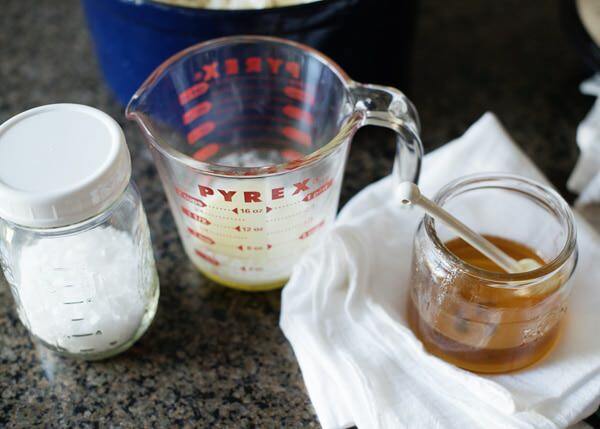 Oh this method with the honey- all in my favorite pot! The. Best. Popcorn ever! Have your ever made a lavender butter? I have had a hard time finding it up here on the north shore. I think the flavor would be lovely with the butter and honey! Thanks for the recipe! I haven’t. Lavender is tricky. If you use even a smidge too much it can taste like soap. Great!!! Perfect! !! Need i say more? tried this tonight—perfecto! new go to snack when Im craving something to snack on! thank you! I’ve had great great great results using our Lodge cast iron wok instead, no shaking required! The shape of of wok is the secret; woks focus the heat into the bottom center center and as the kernels pop, with a top, the popcorn falls to the sidewalls as more kernels moves towards the center and takes its place. The popcorn typically doesn’t burn at all (just gotta remember to turn off stove after like 20secs after the first pops). I just made this right now and blew my own mind at how perfect the popcorn came out. I’m serious. This is crazy. The popcorn is perfect. I’m losing it right now. Hahaha! Glad that you are so happy! I’ve made this recipe at least 5 times now – almost weekly! I haven’t bought microwave popcorn since I discovered this recipe. I love that it doesn’t require any special equipment, and makes for a quick and easy snack for a large group. I don’t use the butter and honey, but I do add a little salt and garlic powder! 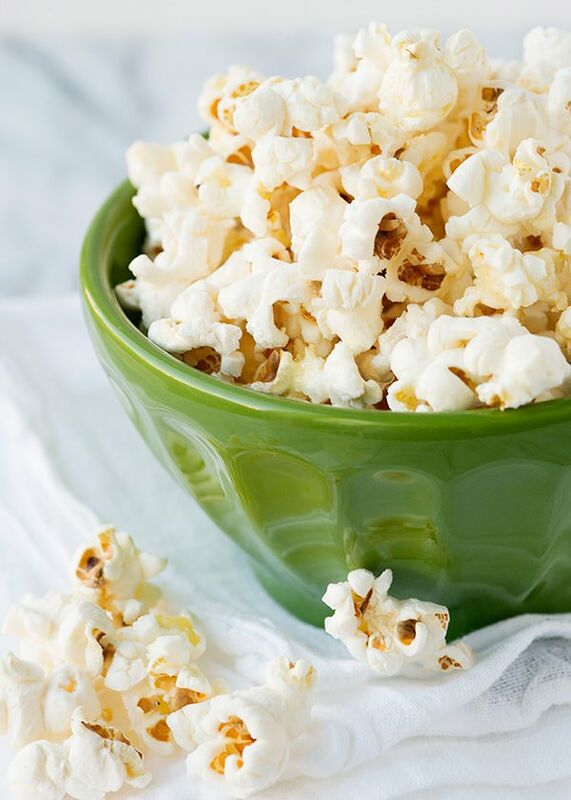 It’s school holidays here in New Zealand, so I could not have found this at a better time ☺️ I’ve been looking for the perfect popcorn recipe and after making it am happy to say I need look no longer – thanks! This is so helpful! Thank you for sharing. Just made a perfect popcorn! Bree you are amazing I just signed up for your newsletter!!! This was the best! I made two batches. This was great! I used olive oil instead, with curry to top it off. Do we pour both or only one but which one. Thank you very much for the recipe, came out perfectly! I used olive oil and it they taste just fine! Such a simple – but important -step. Thought I was resigned to microwave popcorn after some failed stove top attempts, but glad I decided to Google “how to…”. Liked your honey idea, so melted butter in hot pan with a couple of spoons of brown sugar. Kind of sad it’s so good. Gonna try this … but how in heck do you “shake” a heavy cast iron pan?? yikes …. so this corn came out tasty but nearly burned …. i have one of those annoying flat top electric stoves. could be it. also my “shaking” was sliding the pan (cast iron!) to and fro on the burner. am i supposed to actually pick up and shake? sounds dangerous … i too seem to be one of those people perpetually burning popcorn. oh well! If your popcorn was almost burnt you cooked it too long. Yes, you actually shake it. Use two potholders and move it around. Warning. If you have a flat/glass top stove and you slide a heavy cast iron pot/pan of popcorn back and forth, I guarentee that the glass top will be damaged. They were just not designed to take that kind of abuse, no matter how great the popcorn might turn out. I feel like people have enough common sense to know that and it says to pick up and shake. That’s awfully snarky, particularly given Artie’s comment appears to be in response to Karen Fuller’s note that she slid her cast iron pan to and fro across her flat top stove. Snarky? Maybe. But I feel like you should use some common sense when cooking. If you feel like it is a bad idea to shake a cast iron pan on a glass stove, it probably is. I don’t have a ton of common sense, but I used your method. I have a gas cook top (love). I ground sea salt into the melted coconut oil and added 2 tbs butter then added additional kernels. Also put the dutch oven lid about 1 inch ajar instead of removing the lid altogether and shook it. The popcorn was a teensy darker than ideal, but was crispy and yummy! Did not add any toppjng after popping and was a big hit with hubby and 10 year old. Thanks! I hate the additives and gross oils used in microwave popcorn, so I used this method. 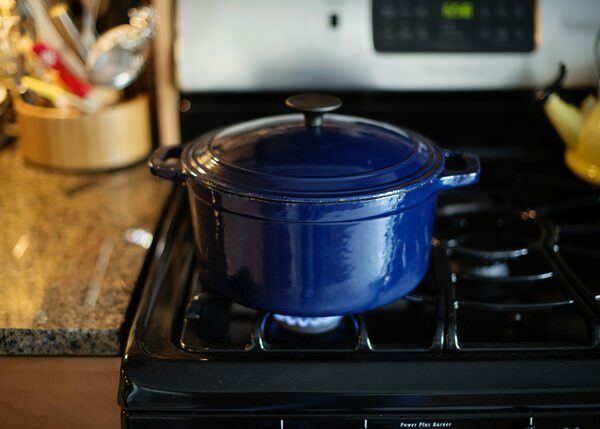 I have a gas cook top (love) and I think Dutch oven is key- cast iron, baby. I ground sea salt into the melted coconut oil and added 2 tbs butter before adding 2/3 c. kernels. Also put the Dutch oven lid about 1 inch ajar instead of removing the lid altogether and shook it. The popcorn was a teensy darker than ideal, but was crispy and yummy! Did not add any toppjng after popping and was a big hit with hubby and 10 year old. Thanks! I made this recipe and it was great! However, I read through the comments and am no longer interested in looking through the rest of your site. Your responses are quite rude and not very welcoming to have people return to your site. There is enough negativity in the world and people don’t need to make an honest comment and be told they don’t have common sense. Or your “if it smells burnt, you probably burnt it” comment. Yikes. God gave us all different gifts, and, honestly, not everyone was given the gift of common sense. I had a couple roommates in college that had no clue about stuff that seemed like “duh” stuff to me, but they were crazy book smart at stuff that I wasn’t. You are obviously a talented and beautiful woman and mom, maybe instead of being rude and defensive you can just give them helpful comments. Cooking involves all 5 senses. You need to use them all while cooking, and that is not common sense. If something smells burnt, it most likely is. By all means, please feel free to never return. I’m sorry that you feel that I’m rude. Best wishes to you. To Julie – Instead of being rude in return, you could have given her this personal critical feedback privately rather than publicly. It seems to me you made the recipe with success. With all the negativity in the world, I’m surprised you decided to take the time to add more here. ps. To Bree – I made the recipe with olive oil and canola oil – both with success. My popcorn was from a CSA share and was harvested and dried out by a local farmer from last season. Great work on coming up with this method! REALLY? Whos being rude? When you read everyones success with this recipe, one might think they are screwing up. If it smells like its burning…..uhm. i guess thats why they put do not eat on things like shoe polish. THINK PEOPLE! Its always someone elses fault. Some people shouldnt be near a stove or use sharp items if they screw up something this simple. I guess thats hy there are microwaves. I guess if thet leave popcornin micro too long its GE’s fault! Not yikes, I’m not saying shake it vigorously, but you need to move the kernels around. 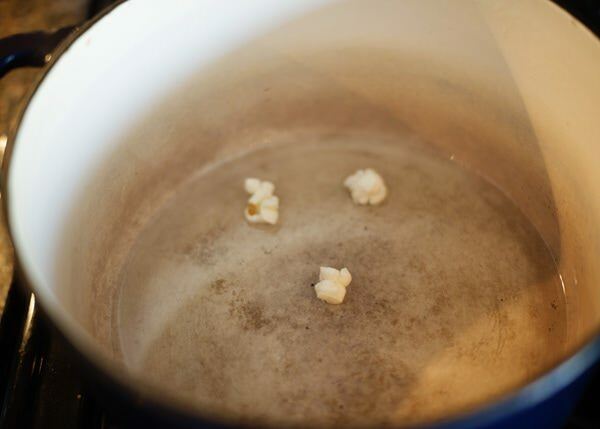 I googled “how to make popcorn on the stove” and this was the first result–and it was SO HELPFUL! I now have a big bowl of popcorn, and didn’t have to rely on our faulty microwave. Thanks!! Thank you for the tip. I’ve never made stove top popcorn! This is awesome! Thank you for the recipe..
Great recipe, worked perfect for me. Thank you!! 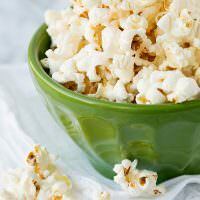 This popcorn recipe is perfect! I had never made stovetop popcorn before but our air popper broke and we had kernels so I figured I would try it. My three year old loved watching the kernels pop and counting down from 30 while the popcorn was off the burner. I highly recommend the honey butter- light, sweet, and delicious! I just made this for my 2 year old granddaughter and I to enjoy while watching Disney’s Lady and the Tramp. It was DELICIOUS!! The coconut oi, butter, honey and salt are a nice combination of flavors. I used a gas range and stainless steel dutch oven and it came out perfect! Not one burnt kernel. Beats microwave popcorn! Thanks!! Oooh Bree I am going to try honey butter tonight for movie night. We usually add melted butter, salt and freshly shredded cheddar or grated parmesan cheese. Or salt, butter and M&Ms. 🙂 But honey butter sounds awesome. Thanks for the simple and perfect recipie, the pop corn turned out very well. My kid and wife enjoyed my little popcorn treat ☺!!! Awesome ..gonna try this ..i will buy the ingredients right now ..hahaha ..thanks for recipe and how to make it ..its much easier with the picture you give ..gracias ..tq ..terima kasih .. This sounds delicious!! I’m going to try adding cinnamon. Thanks for the recipe! We made this on our campstove in a Dutch oven at a Boy Scout campout. Everyone came sniffing around. It was fast, easy, simple and your instructions and pictures make it fool-proof…well almost. We just loved it. My new favourite way to eat popcorn! Sometimes I skip the butter & honey and just sprinkle maple kettle seasoning on it. So yummy! Thanks! My aunt & nephew jus used your easy & simple directions & the popcorn is perfect, my nephew is currently eating the popcorn & lovinggggg it 🙂 You definitely made our night! This is the best recipe I have found on the internet, I couldn’t stop dipping my hand in the bowl for more until it was all gone. My popcorn did not come out with any burnt smell and most of the kernels thoroughly popped. Perfect! Couldn’t believe how easy and successful this recipe was. I had some homegrown popcorn but had been leery about trying to pop it. No more microwave popcorn for me! I think I messed something up by being too impatient bc 1/2 my kernels weren’t popped but it made plenty for me to shovel handfuls into my mouth right now. This is delicious!!!!! Haha! I’m not very patient wither. Bree, thank you for this recipe! The power went out and I stood in the dark, wondering what on earth was to become of movie night. Thankfully, an iPad and your recipe on our gas stove has saved the day! THanks for this recipe Bree. We are trying it out right now, we’ll get back to you and tell you how it goes. Used 4 kernels instead of 3, hope that’s not a problem. But they certainly all popped. We opted not to use the honey. Guess its just different strokes for different folks. Now the last of the popcorns is popping, can’t wait to open it up and see how it worked. Right now 4 out of 4 stars, thanks for all the tips. Update: looks like we must’ve done something wrong, it appears we’ve burned the popcorn pretty thoroughly. Will have to try again, be sure to let yall know how it goes! You’re burner is too hot. Did you take it off the burner to even out the temp? Thanks Bree! Think you might be on to something. Will try again. Happy holidays! Have a “poppin” christmas!! Could you please help me on how the popcorn become crispy.i cook popcorn on a stove and i follow your procedure in cooking.it is crispy but why if i put melted sugar it’s not crispy already. I’m not really sure what you are trying to make? This isn’t a recipe for kettle corn. Just did mine and the result is wow. Thanks a bunch for this helpful tip. I can’t wait to try this for myself. The 3 kernels trick is unique. I must also comment that I had no idea Maldon salt was used overseas. I used to live down by Maldon in Essex, UK! Not only is it used here, it is really $$ to buy. But worth every penny. I followed the first two steps to the T (I am a perfectionist) and then the oil and kernels caught fire. I have a gas stove so idk if that is what caused it but just in case readers with gas stoves may want to try using just medium or medium-low heat instead of medium-high. I still have some traumatic stress problems from a house fire when I was a child, so this was a particularly scary cooking event for me. Coconut oil, as I know now, is not supposed to be heated to high temperatures. Not mad or upset just a PSA. Perfect and delicious! My son loved it as much as I did. No more microwave popcorn for us. Your site was the first hit on google, but the title wow’d me. Thanks for sharing the recipe and tips. It made a for a perfect 1st time making stovetop popcorn with my 7yr old daughter. I made it in a stainless steel stockpot but otherwise followed recipe exactly. I didn’t like it. I followed the recipe exactly and still came out with slightly burnt smelling popcorn, which I can’t use in my amazing caramel popcorn. My kids loved it just eating it plain, but i felt like there was too much oil used. 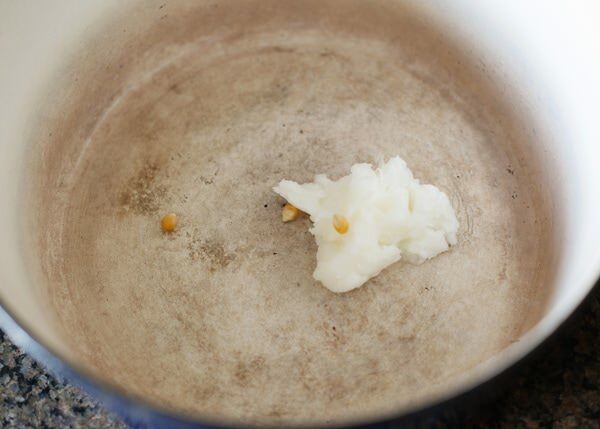 This method might produce perfect popcorn if you reduced or changed the oil used and were extremely careful with the heat used. It’s going to take a few times experimenting with this recipe before you get it right on your own stove. 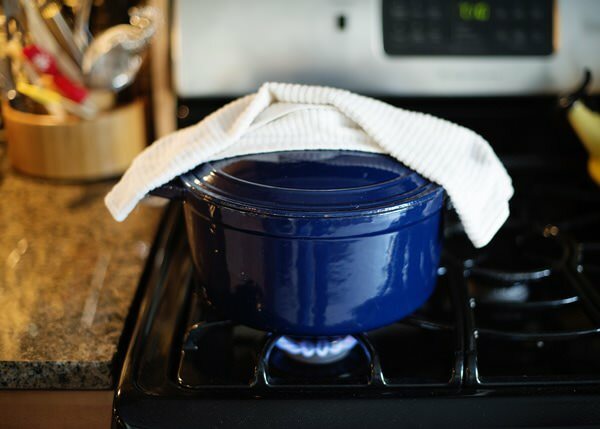 I have a gas stove that I know well but still… I don’t like wasting food and this method doesn’t improve the taste, quality, or make this recipe healthier. So is it worth the effort? Probably not. I’ll be trying something different, either a different recipe or buying an electric popcorn popper. I’ve had success with the brown bag microwave method but I’m moving away from microwave cooking as it reduces the quality, nutrition, and taste of food. If it smells burnt, then you most likely burnt it. I just made this popcorn for my fam while we watched a Minions movie and I have to say that this recipe makes perfect, delicious popcorn! So easy to make and I had no problem shaking the pot, haha. I used coconut oil instead of butter and just salted it without the honey. I feel like I can do anything now. Just brilliant! You rock. 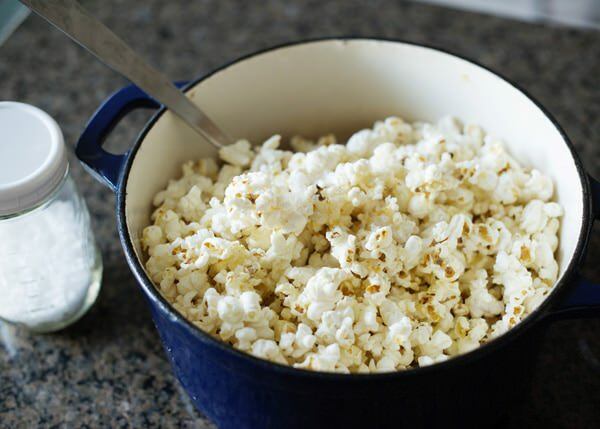 We have just tried this recipe after a few failed attempts to make perfect popcorn on the stove! Thank you! This is perfect as a snack when you’re out camping with a small gas stove – can’t wit to try it out in the wild! It actually isn’t straight from food.com, but I’m sorry that you find my post sad. This recipe is great. First time I’ve made stovetop popcorn and it turned out great. My family likes it better without the honey, but I like the sweet flavor it adds. Thanks for the recipe! Hi Bree! I’m trying to make this delicious sounding popcorn but I’m having trouble getting the initial 3 kernels to pop! the coconut is going crazy at the temperature, and I waited a good five minutes with it splashing everywhere (top on) and no popping occurred. I’m scared to raise the temperature or wait long….something you’d recommend I try? Thanks! I really am not sure, my guess is that your heat isn’t hot enough. I tried this and at was perfect. Make sure your whacking it on medium-high heat. Not medium or less. The oil should smoke and almost immediately after, the 3 kernels should pop. Also, don’t use kernels that are old (up to 2 years max), and do not refrigerate them. WOW!!! Been trying to get away from microwave popcorn for years but my stovetop popcorn has always turned out unpopped or burnt. Your straightforward recipe (and pics and tips) made it so easy. We just enjoyed the tastiest popcorn ever! I have made stovetop popcorn my entire life, but never in my Dutch oven. I followed the directions exactly as written (minus the topping, I just did salt), & it was seriously the best popcorn I’ve ever made. Thank you so much for posting! I just made this and it’s delicious. I used grapeseed oil instead of coconut oil because it has a high smoke point and is good to use when cooking with higher heat. I might be missing something obvious, but I’d like to make sure that the steps listed here are totally clear to me before I make my first attempt at your awesome-sounding recipe. When exactly do you recommend removing the pot from the heat? Around two minutes after you’ve returned it to the flame, when the popping has slowed down and you’ve removed the lid to allow steam to escape? Thank you so much for clarifying this detail for me! After the 3 kernels have popped. Wait 30 seconds then put it back on the heat. And then after the popping has stopped. OMG!!! after years of search… the BEST popcorn EVERR!!! thanx!! I love this recipe and have made many variations on it. Thanks for sharing it! Wanted to throw out a tip for anyone like me looking to eat lighter – this popcorn is delicious with no topping, or just salt. (It is also delicious as written… Yum.) Using a tip from another blog, I ground kosher salt with a mortar and pestle to make it super fine, so it sticks to the popcorn instead of sinking to the bottom. I googled “how to make popcorn on the stove” and this was the first result–and it was SO HELPFUL! Now I have a big bowl of popcorn to make caramel corn! Thanks!! I was very nervous to do this based on some of the comments, but it came out perfectly! Only recently I’ve tried cooking more than I have before (I have lupus and many other health conditions) and I’m trying to eat more healthy and cut out processed food. I used all organic popcorn, butter, coconut oil, and Celtic Sea salt and it tasted amazing. I’m very grateful to Bree for this recipe and believe me if I can do this anyone can! Perfect! Not a hint of burned flavor. Thanks! I had never tried making stove top popcorn before, & never use my microwave for anything other than re-heating tea, so I gave this recipe a try. This made great popcorn, perfectly cooked and my home smells divine now, thank you! This makes rock-hard popcorn. Enjoy! …. Worked perfectly and was so fast! Thank you!! I used a large stainless steel pot. Worked for me too in a stainless steel pot. Thank you. Can you salt the oil before popping, if you don’t want to use butter after it’s popped? I would just add salt and the very end while it’s still hot. The 30 second wait did the trick! The second batch I added sugar to the oil for it to dissolve – Yum!! How much sugar did you add sophy? 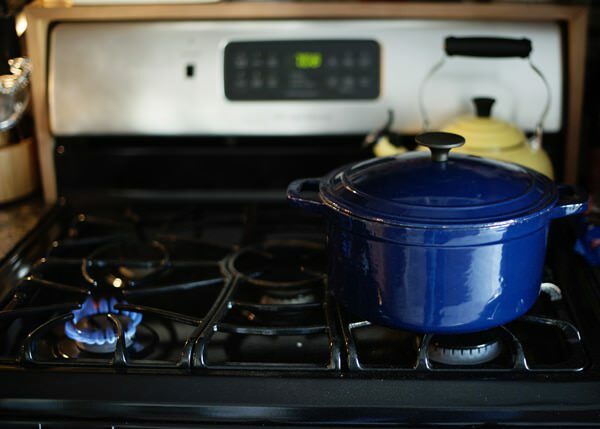 it lets you know when the pot reaches the right temperature. Thanks for this recipe! This may be a silly question, but when you have waited 2 minutes and the popping has slowed down, do you take it off the heat when you take the lid off? I love this recipe. Your directions made it so clear that even someone without common sense should be able to follow them. I also appreciate that you reply when someone has a question. You are not snarky but matter of fact. I put a small amount of truffle oil on it at the end and it was yummy!! This method worked like a charm!! ITs amazing! Just perfect! Thank you so much for sharing this recipe. Your recipe popped up first in the google search and I am very much happy with the outcome of my stove top popcorn. My microwave has broken down and I was wondering how to make it on a stove top. This is DELICIOUS! And so easy! The first time I made it I used the honey-butter drizzle. However, I find that I like it better without that. I bought some Morton’s Popcorn Salt and that’s all I add. Soooooo good! i have tried this method for the first time and it has worked perfect, thanks. May I ask what size dutch oven you are using? I believe that is a 7-quart. I just got rid of it, otherwise I would go check for you. Terrible advice. My popcorn half-popped and half burned. I had a little more success with canola oil, which inclines me to think that it’s half-baked hippie ideology that contributed to your garbage instructions. Whatever happened to good old fashioned popcorn machines? I’m sorry that you are having a difficult time, but you seem to be in the minority if you read the comments. Just tried it. PERFECTION. My first time making popcorn, actually, so thanks. Everything popped and nothing burned. I made it with just olive oil and salt, cause that’s all I had on hand. That’s usually the best way. Simple is best. I won’t eat microwaved popcorn (and neither should you), I resent buying popcorn by the bag, and my air popper recently died. I wanted some popcorn while watching a movie this afternoon, so I decided to make some on the stovetop and googled “how to make popcorn” and this came up. Followed the directions exactly in my dutch oven, and it came out perfect. Every kernel popped, nothing burned (using coconut oil), and so delicious! I made two batches — one with the suggested butter and honey topping, and one with nutritional yeast — mixed together they like a healthier version of that delicious Chicago stuff. I will not be replacing my air popper! Thanks so much for this. I am so glad that you like it so much. Hey! Could you tell me how much popcorn this recipe makes?? Thanks! I don’t really know. Maybe 6 cups? Worked perfectly. We’ll definitely be trying some adventurous flavors now that we know how easy it is. Thanks for this — removing the test kernels, waiting the 30 seconds before returning the filled pan to the heat, and removing the lid ASAP to vent steam all seem to be key to success. Tonight’s variant: Salt in bottom of pan, 1/4c oil made up of a couple tablespoons of olive, a scant spoon of rendered bacon fat, and the rest peanut oil. Popped per instructions (perfection! ), turned out into another, cold pan, and then shook sweet paprika, fine-flake nutritional yeast, and a good brand of white cheddar popcorn powder (don’t judge me) overtop. Lid on pan, shake to coat…and now I’m devouring it. Best popcorn in a LONG time! How do you get that “movie theater” taste when using coconut oil? I asked at the local theater and they said they used coconut oil to get theirs to taste that way! Previous posts say that coconut oil leaves NO taste. I WANT MY MOVIE THEATER TASTE! Should I add more of the oil? I really don’t know. I highly doubt that they use coconut oil. You can buy movie theater popcorn oil in the store. I made this tonight after googling, “How to make homemade popcorn” and finding your blog. I purchased the kernels a couple days ago knowing I would attempt this. O.M.G!!!! ???????? 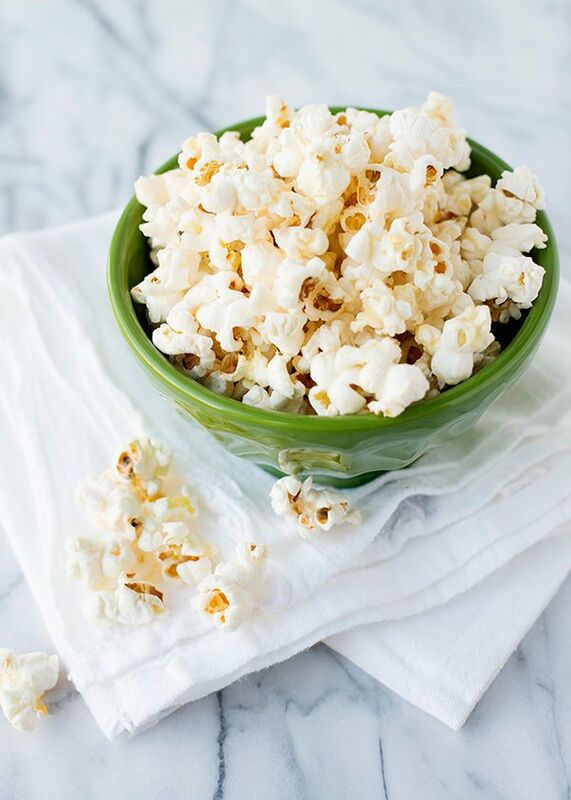 This popcorn IS PERFECTION… none of the kernels burned and the coconut oil gives the right flavor, even before the salt. I used pure, unrefined, organic coconut oil, Orville Redenbacher’s non-gmo, whole grain, gluten-free popping corn kernels, fine Mediterranean Sea Salt, ground Thyme, organic crushed Rosemary, organic crushed red pepper, organic ground ginger, basil leaves and ground white pepper. Because of this technique I will NEVER (read: Never) buy bagged popcorn again!!! Thanks for sharing… ???? Nice, I got it on take one. Timing is all it take, nice blog. Thank you SO MUCH Bree! We have movie night every Saturday, and every Saturday I make awful stove top popcorn! Just tried doing it this way, it is perfect! Added your touch to the kids’ bowl, they LOVE it! Thank you again! 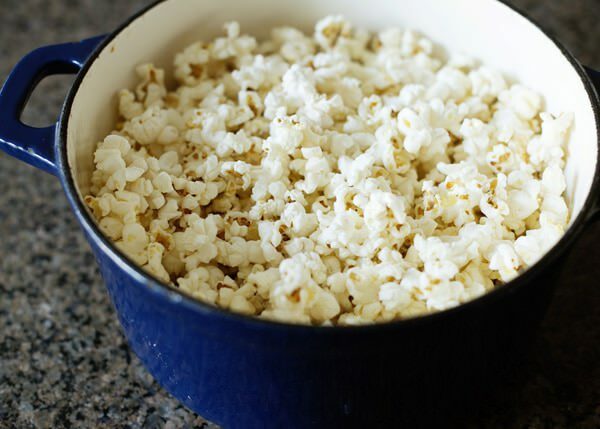 I always pop popcorn and even when all the kernels are popped they end up really hard and crunchy but this method got rid of that affect completely! Thank goodness!! I’ve used this method for cooking the popcorn twice now, with perfect results every time – hitherto unheard of, always used to be a hit and miss affair. I have yet to try the method of flavouring it, as I used the popcorn for a salted caramel recipe but I’m sure this recipe is delicious and I look forward to getting round to trying it. I used run-of-the-mill vegetable oil, as that was all I had to hand at the time, and it worked wonderfully. Thank you for sharing this! This is a great recipe! I just tried as recipe calls with all Non-gmo corn and organic everything else, and subbed sea salt for Pink Himalayan Salt. I cannot wait to try this with CannaButter and CannaCocoOil!! It doesn’t matter, I use whatever I have. Usually the hard kind. This. Works. Thank you for sharing!! I could eat this for dinner (and I just might!). Made it today for the first time as a trial for my Christmas party. It is *definitely* going on the menu! I love this recipe! Perfect every time. I add a bit of cayenne pepper to give it a bit of heat. My go-to recipe for popcorn. Thanks for posting. What if you don’t have coconut oil at the moment you want to make the popcorn. Can the butter replace the coconut oil? Am actually want to start making them at my store so I got a popcorn machine. I’d use vegetable oil. Butter will burn. Thanks Bree..,pls I’ll like to know the time the rest poured karnel will spend after removing d 3 karnels before bringing the pot down from the stove. 3-5 minutes? It really depends. I followed the recipe & instructions carefully, though only one kernel popped. Didn’t let that STOP me, I continued & added the 2/3 cups of kernels, waited 30 secs and enjoyed a wonderful bowl of popcorn ?… I like Garlic powder, so added sea salt with it and butter and VOILA????!! Thank you, it was great as you said it would be!! Bre, Bre, Bre I love your your recipe. I had not made stove top popcorn since the late 1950’s yes you can teach an old dog new tricks made a great supper Bowl snack. Non Gmo, cold pressed Coconut oil is a supper food for brain energy, medium chain triglycerides are the key. Honey is another amazing food when it’s raw and unheated. Nutritional yeast is another well kept secret. I needed to expose the genius of this recipe. I see you Bre thank you. Excellent! I used Orville Redenbacher’s Popping Oil, Orville Redenbacher popcorn, and Butter Buds. It worked out great! Thanks for the post. First time making popcorn, aged 46:-). I followed the instructions to the letter except I used sunflower seed oil and instead of coconut, which I didn’t have at home. I ran into a serious problem at the end.. I CAN’T SHOVEL THIS STUFF INTO MY MOUTH FAST ENOUGH!! I’m worried there’ll be nothing left for my daughter, who this is really for. Thank you for a fabulous recipe. Mine turned out a little soggy and so I put it into square cake pans at 200 degrees F (I have a convection oven, if you don’t have a convection oven then put it at 225 degrees F) for 40 minutes, then let it cool down on parchment paper and they turned out perfect! My family couldn’t even believe that It wasn’t tore bought 🙂 Thank you for the recipe! This has become my family’s movie night staple. We often use different flavors for variety, but it’s great just as-is. Seriously awesome recipe! It was my first time making popcorn and it was perfect! My husband was in heaven. We can’t stop eating it! Thanks for a great recipe! On the taste of coconut oil. Do you sometimes have half a bottle of red wine left over? Melt some coconut oil on low heat and pour on the wine in the bottle. Put in fridge. Oil will become solid and seal off the wine. Does not affect the taste of the wine at all! Awesome recipe! This was my first time making stove top popcorn and it was perfect. I think we had less than 20 unpopped kernels in the whole 2/3 cup and no burnt pieces. It turned out way better than our usual microwave popcorn and the looks on my kids’ faces when the popcorn started flying around inside the pot was priceless. I had no idea it was this easy or fast. My 6 year old son has declared this as the best day ever- it was that good, lol! Thanks so much for sharing your step-by-step instructions! Thank you! Super easy and yummy. After burning too much popcorn in the microwave (ours is quite new & powerful), I tried this method. It worked fantastically well and was so easy!